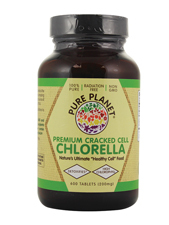 Product Description: Pure Planet's Premium Cracked Cell Chlorella is the finest chlorella available in the world. This amazing single-celled organism is nature's richest source of detoxifying chlorophyll and cell building R.N.A. Our easily-digestible tablets are great additions to any detoxification regimen. Warnings: Keep out reach of children. Additional Info: Store in a cool, dry place. Does Not Contain: GMO's, Binders, Fillers, Excipients, Flow Agents, Pesticides, Herbicides, or Chemicals of any kind. Suggested Use: Take 15 tablets (3 g) per day.